Ah, tofu. So versatile. Humble tofu, you take on the flavours of your neighbours with much gusto and much skill, making you the perfect ingredient for a damn good dish. You’re perfect stuffed with fish paste and fried, steamed with prawns and a smattering of fried garlic and spring onions, and miso soup would be lonely without your presence. Pockmarked Aunty Ma would have been a nobody without you. And yet you excel not only in your savoury incarnations, but in sweet delights. Behold: the Tofu Fa (豆腐花). 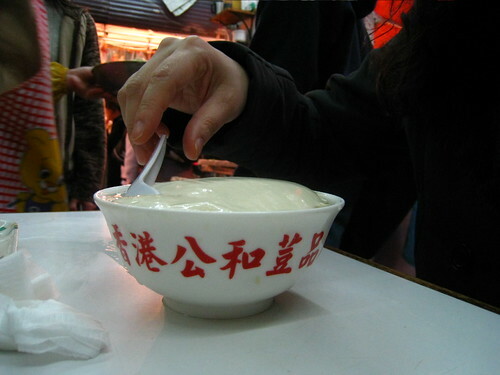 Silken tofu in a clear sweet soup. 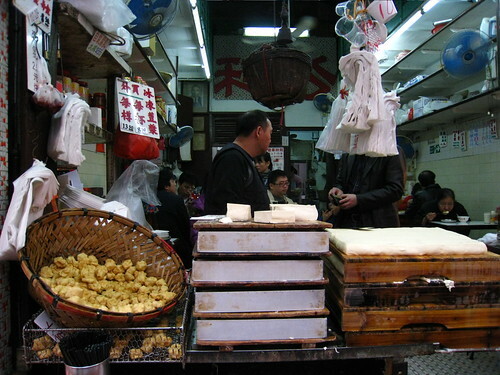 A bit of exploring around the streets of Sham Shui Po today led us to this famed little shop specialising in tofu. 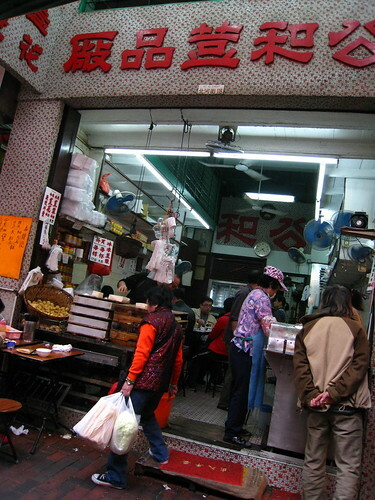 Kung Wo Soybean Factory is one of the oldest companies in Hong Kong, having been established over a 100 years ago – in 1893, on Canton Road in Mong Kok. They’ve gotta be doing something right. 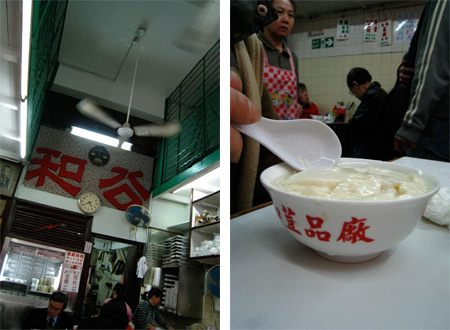 And I shall testify for that – the 豆腐花 I had was seriously the best I’ve ever had – impossibly silky, melt in your mouth goodness. Smooth and fresh, with no hint of the bitterness that some tofu desserts still retain despite the copious amounts of sugar some vendors add to the soup. The clear soup was not too sweet, but sweet enough so that I, a promising future diabetic, didn’t need to help myself to spoonfuls of the yellow sugar laid out on the table in tubs. Perfectly warmed, though a cold version would have been excellent on a hot summer’s day. And at only $6HKD a pop, who can complain? Such a small price to pay for such deliciousness. Are you getting the hint yet, London?